Gold Medal Winner of the 2015 Axiom Book Award for best business theory book! Today's business environment demands faster responses, better service, and increased agility. 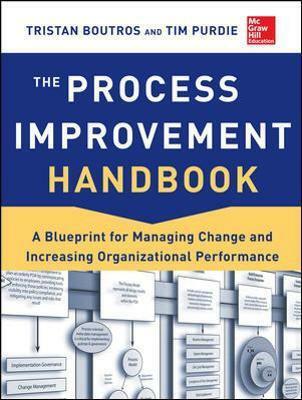 The Process Improvement Handbook reveals how to design effective process improvement structures, organizations, and cultures to meet those needs. Focusing on specific process improvement knowledge areas, this practical work establishes the foundation required to create, maintain, and measure processes while equipping practitioners with the necessary skills to deliver consistent, successful outcomes. This definitive resource introduces a body of knowledge for anyone looking to improve their operating environment. The result is process self-sufficiency, extensibility, sustainability, higher quality, and overall speed that increases competitive advantage. The principles explained in this book encapsulate everything needed to be more "process mature," and to enable process excellence from start to finish. Tristan Boutros is currently Senior Vice President & Chief Process Officer for one of the world's largest media and entertainment firms located in New York City where he oversees Program Management, Process Improvement and Enterprise Architecture. He holds over 10 professional designations including his Lean Six Sigma Black Belt (LSSBB), Project Management Professional (PMP), Certified Scrum Professional (CSP), and his Master Project Manager (MPM) certification. He has over 10 years of business, technology, and management consulting experience at companies such as Pernod Ricard, IAC, DTE Energy, BlackBerry, and Warner Music Group and has been a successful entrepreneur. A skilled facilitator and change agent, he specializes in delivering rapid business value using numerous techniques and methods including the Process Oriented Architecture and Process Ecosystem approaches described in the book The Process Improvement Handbook: A Blueprint for Managing Change and Increasing Organizational Performance.